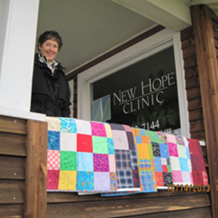 Suzanne Stilwell, wife of Club Member Jim Stilwell, delivered six baby quilts to the New Hope Clinic in October. As you can see from the photo these were lovely quilts and all were made by Suzanne. She offered to make a baby quilt on behalf of those donating $25 at the Silent Auction at the Hearts and Honky Tonk FunRaiser last February. Thus, through her sewing efforts, Suzanne raised $150 for the Club and six babies will receive these lovely quilts.